Energy from the Sun heats the surface of the Earth. Water is evaporated from oceans, rivers, lakes, etc. The warm, moist air rises because it is less dense. Condensation occurs when water vapour is turned back into water droplets as it cools down. Clouds are formed. Precipitation occurs as water droplets get bigger and heavier they begin to fall as rain, snow and sleet, etc. Some water is intercepted by vegetation. Some water may then slowly reach the ground. Some will evaporate from the surface of leaves or be taken up by the plant roots, and some of this water will eventually return to the air as vapour through the process of transpiration. This slows down or prevents some water flowing back to the river. 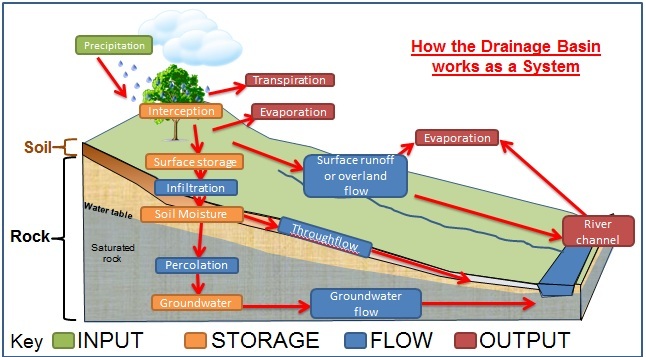 Some water flows across the surface of the ground – surface run-off. This happens when the surface doesn’t allow water to penetrate. 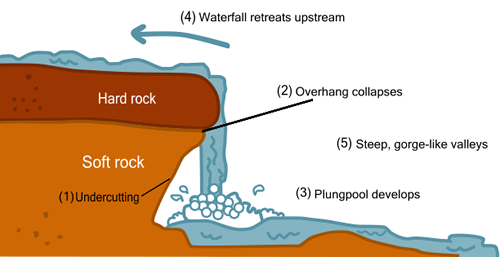 Surface run-off is more likely to occur if the ground is saturated with water or when the rock is impermeable. This water moves quickly to the river. Some water infiltrates into the soil. This through flow moves more slowly back to the river than surface run-off. Some water percolates deeper into the ground and is slowly transferred back to the river or sea. The major stores of water are the ocean, ice caps, land and the atmosphere. The movement of water between these stores is called transfers. 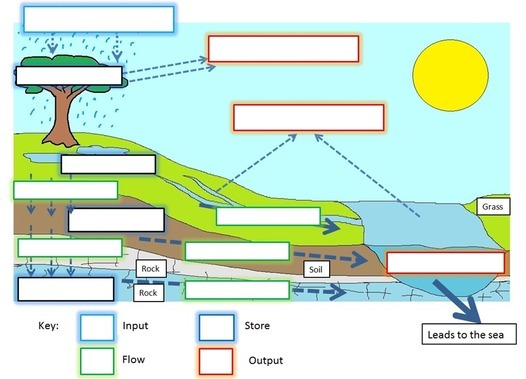 Define the key words for the drainage basin system. 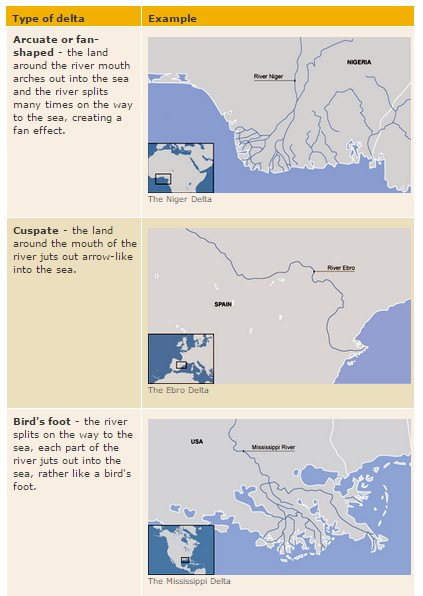 The River processes are the same as we looked at in the Unit of Coasts. You have already learnt this so all you need to do is remind yourself of the forms of Erosion and Transportation that you have looked at. The soft rock erodes more quickly, undercutting the hard rock. The hard rock is left overhanging and because it isn’t supported, it eventually collapses. The fallen rocks crash into the plunge pool. They swirl around, causing more erosion. Over time, this process is repeated and the waterfall moves upstream. A steep-sided gorge is formed as the waterfall retreats. When a river is near its source, it often develops a V-shaped valley as the river erodes down (this is called vertical erosion). At the same time, weathering breaks up material on the valley slopes. Weathered material from the valley sides gets deposited in the river. 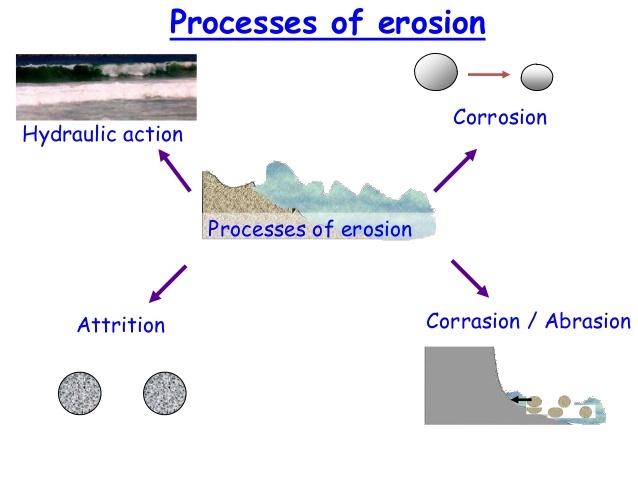 This material is carried by the river and erodes the riverbed through abrasion. 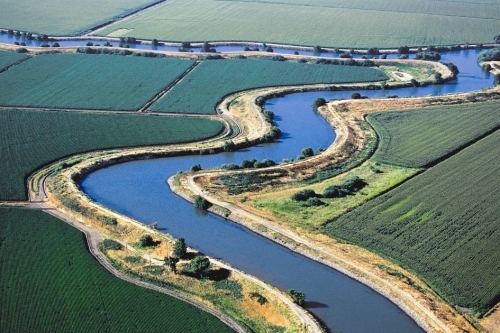 ​Meander: is a bend in the river. 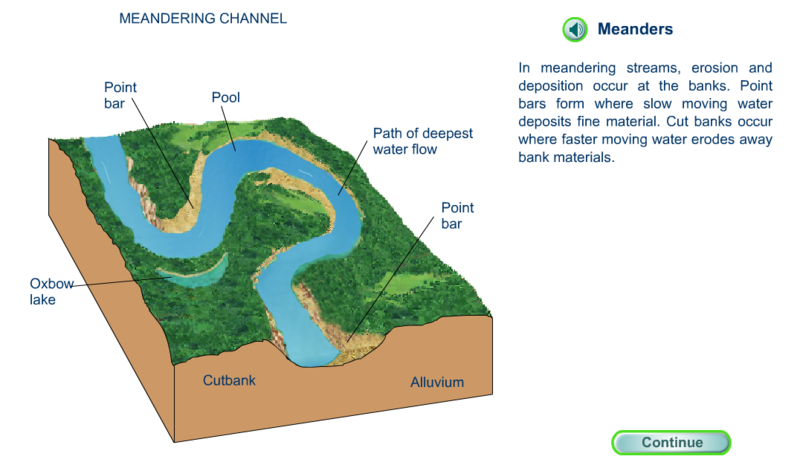 Meanders usually occur in the middle or lower course, and are formed by erosion and deposition. As the river erodes laterally, to the right side then the left side, it forms large bends, and then horseshoe-like loops called meanders. 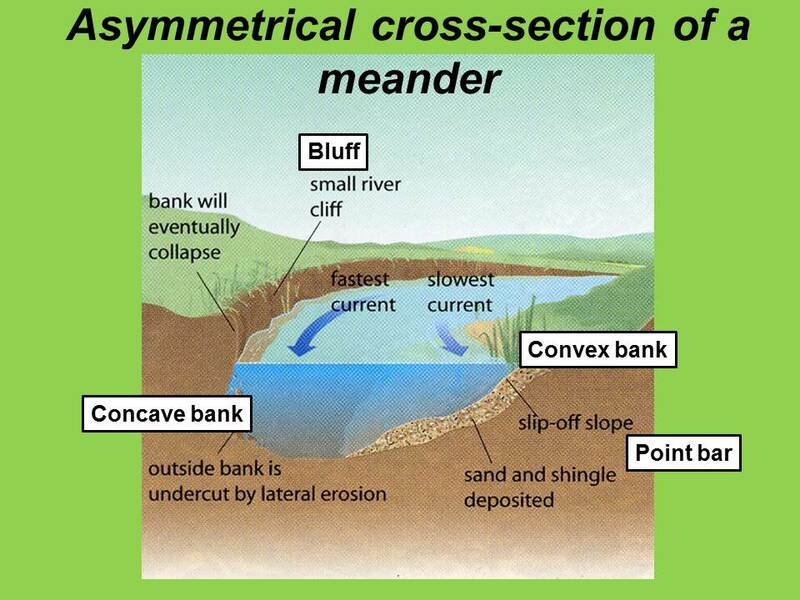 The formation of meanders is due to both deposition and erosion and meanders gradually migrate downstream. The force of the water erodes and undercuts the river bank on the outsideof the bend where water flow has most energy due to decreased friction. On the inside of the bend, where the river flow is slower, material isdeposited, as there is more friction. Over time the horseshoe become tighter, until the ends become very close together. 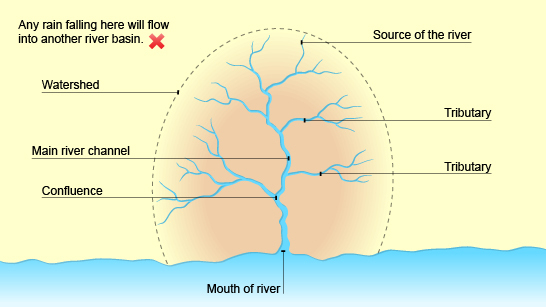 As the river breaks through, eg during a flood when the river has a higher discharge and more energy, and the ends join, the loop is cut-off from the main channel. The cut-off loop is called an oxbow lake. 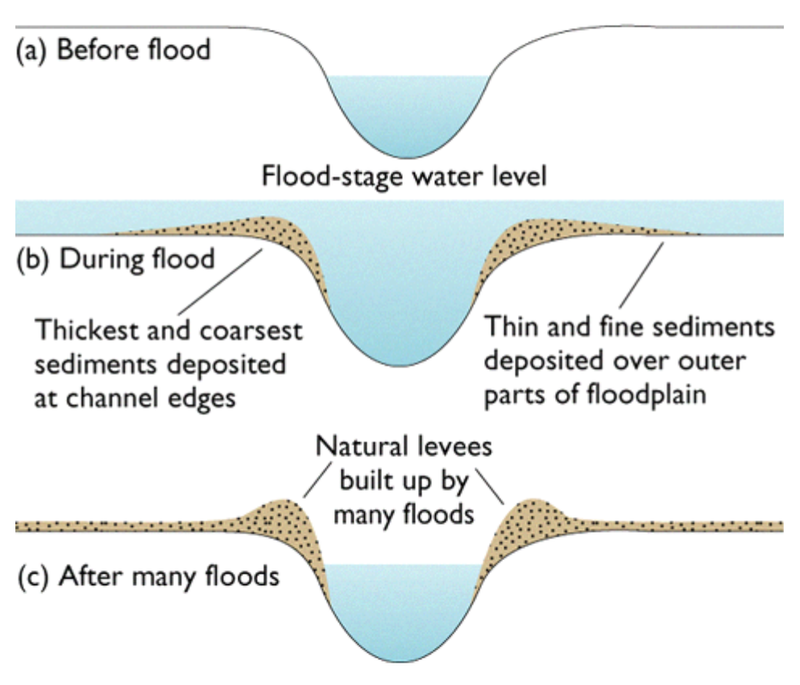 Watch the following animation and explain: What are floodplain and how do they form? Why do people live near rivers? What a storm Hydro-graph is and how it works. 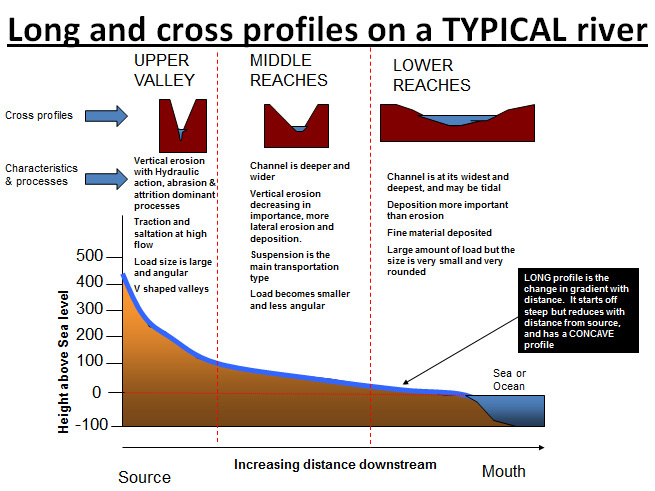 What factors, Physical and Human cause flooding. Using the following three websites create a table listing, describing and explaining the possible management strategies for rivers and their floodplains. Separate them into Hard and Soft Engineering strategies. Describe the location of the Mississippi River. Outline the benefits and opportunities of living near the river - what activities happen near on around the Mississippi? What happened in he 2011 river flood? How is the Mississippi river being managed?